Making You No.1 on the Net ! Warning from No.1 Internet Marketing company Asia: Looking for web design? Just go to any web design company or web designer. Web hosting? Go to any web hosting company. Want to be No.1 selling online? Learn from the No.1 Top Internet marketing coach ranked by top search engines - eOneNet.com. This site offers everything you need to sell online, and make profits, globally, whether you are in Hong Kong, Singapore, Malaysia, China, Korea, Asia, Middle East, U.S., Europe or anywhere else. 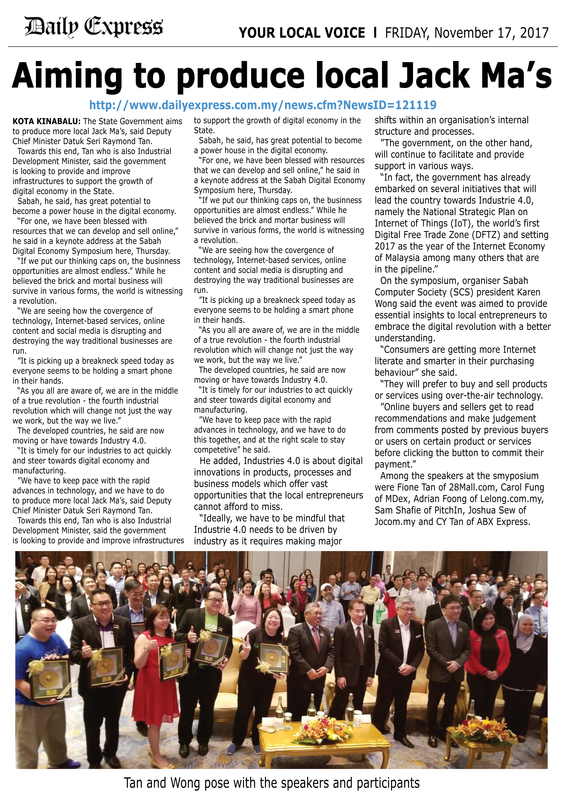 Kota Kinabalu: The State Government aims to produce more local 'Jack Ma's, said Deputy Chief Minister Datuk Seri Raymond Tan. Towards this end, Tan who is also Industrial Development Minister, said the government is looking to provide and improve infrastructures to support the growth of digital economy in the State. Sabah, he said, has great potential to become a power house in the digital economy. "For one, we have been blessed with resources that we can develop and sell online," he said in a keynote address at the Sabah Digital Economy Symposium, here, Thursday. "If we put our thinking caps on, the business opportunities are almost endless." While he believed the brick and mortar businesses will survive in various forms, the world is witnessing a revolution. "We are seeing how the convergence of technology, Internet-based services, online content and social media is disrupting and destroying the way traditional businesses are run. "It is picking up a breakneck speed today as everyone seems to be holding a smart phone in their hands. "As you all are aware of, we are in the middle of a true revolution – the fourth industrial revolution which will change not just the way we work, but the way we live." The developed countries, he said, are now moving or have moved towards Industrie 4.0. "It is timely for our industries to act quickly and steer towards digital economy and manufacturing. "We have to keep pace with the rapid advances in technology, and we have to do this together, and at the right scale to stay competitive," he said. He added, Industrie 4.0 is about digital innovation in products, processes and business models which offer vast opportunities that the local entrepreneurs cannot afford to miss. "Ideally, we have to be mindful that Industrie 4.0 needs to be driven by industry as it requires making major shifts within an organisation's internal structure and processes. "The government, on the other hand, will continue to facilitate and provide support in various ways. "In fact, the government has already embarked on several initiatives that will lead the country towards Industrie 4.0, namely the National Strategic Plan on Internet of Things (IoT), the world's first Digital Free Trade Zone (DFTZ) and setting 2017 as the year of the Internet Economy of Malaysia among many others that are in the pipeline." On the symposium, organiser Sabah Computer Society (SCS) president Karen Wong said the event was aimed to provide essential insights to local entrepreneurs to embrace the digital revolution with a better understanding. "Consumers are getting more Internet literate and smarter in their purchasing behaviour," she said. "They will prefer to buy and sell products or services using over-the-air technology. "Online buyers and sellers get to read recommendations and make judgement from comments posed by previous buyers or users on certain product or services before clicking the button to commit their payment." ■ Call eOneNet.com at 03-2284 6418, WhatsApp 012-232 8878 or register at www.eOneNet.com. Want to join Asia's No.1 Internet Marketing Club? Sign Up Here & get FREE US$25 Internet Marketing eBook. Copyright © Since 2000 eOneNet.com. All Rights Reserved.